This chrome pendant light with smokey glass shade is both classic and modern. 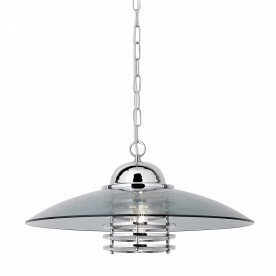 The smoked glass shade is beautifully designed with a coolie tubular clear glass design surrounding the light which looks great on any bedroom, living room, dining room or kitchen ceiling. And the fitting can be adjusted to the perfect ceiling height.